If I have never expressed the importance of 1939 in film, this is a situation in which the opportunity presents itself. Scholars combat about the pivotal year in film history and it seems no one can come to a consensus. My opinion, as invaluable as it may be, tends to lean towards the greatest year in Hollywood history: 1939. The Wizard of Oz, Gone with the Wind, Mr. Smith Goes to Washington,Stagecoach, Dark Victory … the list seems endless of quality films released in a single year. One of my absolute favourite films was nominated for many awards, unfortunately its competition was bar-none one of the greatest filmic creations of all time (Gone with the Wind). The fact some seem to neglect is the absence of an Academy Award statuette in Clark Gable’s pocket for his role as Rhett Butler. The lead acting award went to none other than Robert Donat, the star of the film I will be discussing in this blog:Goodbye, Mr. Chips. Goodbye, Mr. Chips traces the progression of a professor, Charles Edward Chipping, at a public school well into his golden years. Through a series of flashbacks, audiences are able to experience the hardships of a budding schoolteacher trying to find balance in discipline and compassion. Many students dislike Mr. Chips earlier in his career, but a romance and tragedy softens his heart and his relationships begin to grow much stronger with students. Although her role is very brief, Greer Garson made her onscreen debut in Mr. Chips. This film made me fall in love with Garson as an actress and eventually as a person. Her role in the film is idealistic and slightly unrealistic. Mr. Chips and Katherine (Garson) have a chance meeting on a mountaintop and become trapped due to inclement weather and fog. Their time spent together turns into a full fledged intellectual (and eventually physical) relationship. Her purpose in his life is to soften his hardened heart with love and affection… and Greer Garson does it so beautifully. The scenes with Donat and Garson make the entire film worthwhile. There is something endearing about consistency with instructors. Knowing twenty years down the line they have remained at the same school and welcome visits of students past. This, of course, speaks to their servitude and devotion to teaching generation after generation. 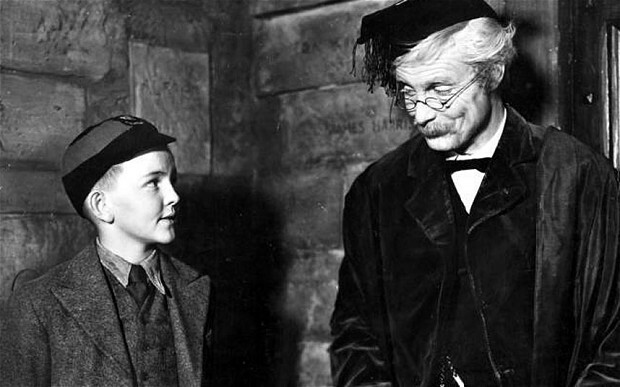 Goodbye, Mr. Chips will cause tears to barrel out and laughs to boom from the core of your being. My only hope is the film will initiate a phone call or quick visit with your own favourite instructor — after all, they shape lives in more ways than one.